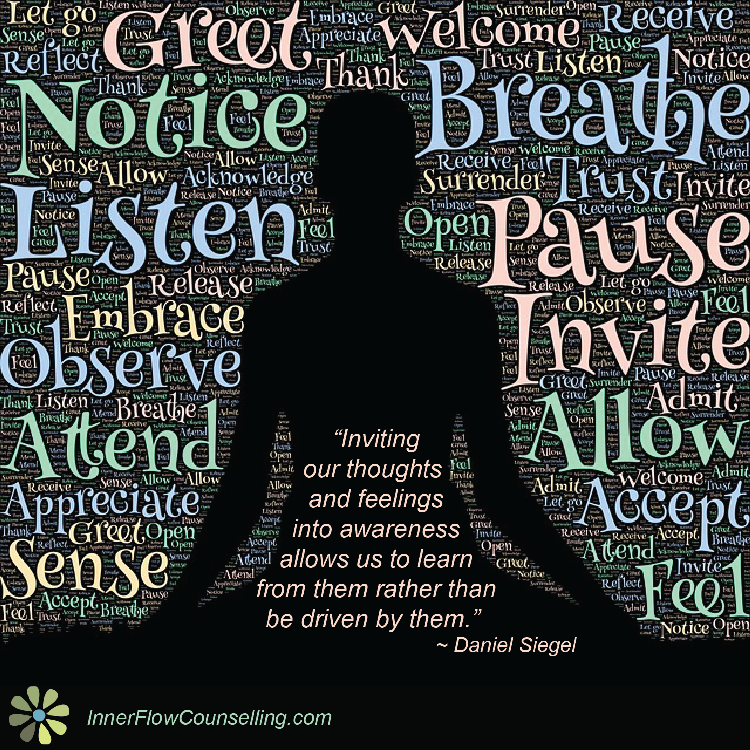 neuroscience Archives | Inner Flow Counselling & Wellness, Yvette Lalonde, MTC. In the three previous parts of this series we explored embodied listening, gaining clarity, and how to re-establish our sense of self during periods of heightened stress. In this final part we will explore attachment theory. 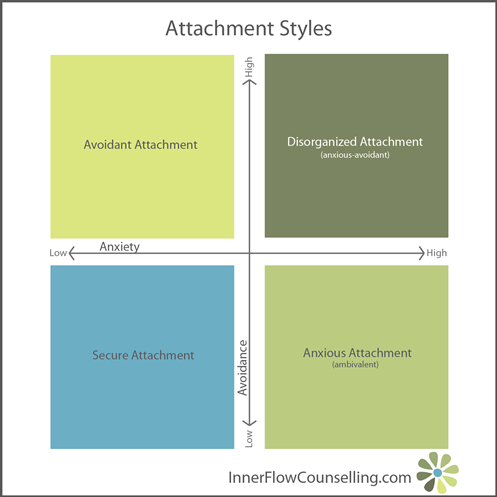 Knowing your attachment style can help explain why you require reassurance from your partner or why you are more reserved in relationships, why you feel hyper-sensitive to your partner or why you are confused by them. It also offers insights into why partners repeat the same unsuccessful communication patterns. There are many factors that account for how attachment styles are formed: relationship with parents, temperament, social support, biopsychosocial stressors, and genetics. The first 18 months of our lives conditions our working models that define how we act in relationships. This means that our guidelines for relating to others are largely unconscious. It is important to note that attachment styles are not fixed, but they do tend to be consistent. The more we experience secure attachment with others the more we move towards secure attachment patterns ourselves. Attachment systems are biological processes that are connected to social interactions. Our actions are attempts to regulate our attachment system, usually through greater intimacy or separation. Karlen Lyons-Ruth, a developmental psychologist, equates the attachment system to a psychological immune system. Secure types are responsive to the needs of their partners and demonstrate empathic qualities. They are comfortable with intimacy and have a steady attachment system – emotional responses are appropriate to situations. They employ connecting behaviour and strategies – thoughts, feelings, and actions that honour both their own needs and the needs of their partners. Avoidant types are dismissive of their partners’ thoughts and actions. They tend to be self-focused and are less skilled at reading their partners’ needs. When it comes to intimacy they fluctuate between hot and cold. Avoidants create distance from their partners to deactivate their attachment systems. These strategies include avoiding mental, emotional, and physical closeness. They also include a tendency to focus on their partners’ imperfections while ignoring their positive qualities. Avoidant type has a pattern of getting involved with people who are ‘unavailable’ and they tend to idolize past partners. Anxious types are preoccupied with their relationships and their partners’ thoughts and actions. They are more focused on their partner and are less skilled at recognizing their own needs. An anxious type craves intimacy to try and regulate their amped up attachment system. They employ activating strategies – extreme attempts to re-establish a secure base – usually acted out while distressed. These strategies are marked by protest behaviours such as withdrawing, hostility, and keeping score. Disorganized types are said to be the least common. They include both anxious and avoidant qualities. Disorganized attachment is characterized by role confusion where the object of affection is simultaneously feared and desired. Patterns of extreme stress and abuse in childhood by primary caregivers inform this attachment style. To learn more about disorganized attachment please use the many resources specific to this type or reach out to me personally. It is very common for anxious –avoidant types to enter into relationships with each other. It is rare that anxious-anxious and avoidant-avoidant types enter into relationships with each other. Due to all-or-nothing thinking and catastrophizing, anxious types prolong asking for what they need – assuming that their needs will not be met – until they explode. If they are with a secure partner the damage may be repaired and needs will be met. If they are with an avoidant partner they are likely to get the opposite of what they need because the avoidant requires distance to regulate. Anxious types are less likely to communicate their needs directly. They should stop hinting; stop assuming; be direct; ask for what they need; and make inferences based on reality, not from the narratives in their heads. This can only be done if they communicate directly. There is nothing inherently wrong about requiring affection and reassurance from a partner. If one’s needs have been communicated in a responsible manner and their partner refuses to meet those needs, this is a clear sign that the relationship is in trouble. Due to a need for separation and a tendency towards all or nothing thinking and mind reading – assuming their partner has malicious intent – avoidant types tend to pull away from the relationship. If they are with a secure partner there is less chance of a reaction occurring or the secure partner will address the issue directly. An anxious partner will try to initiate closeness resulting in a self-fulfilling prophecy of your partner wanting too much from you. Avoidant types are less likely to take into account the needs of their partners. If one has a strong desire to push a partner away or flee then they should communicate their need for space to their partner, and try to find a way that both people get what they require. Timelines and reassurances work wonders if partners are anxious, they will be more likely to offer the space required. Stay on topic. Don’t generalize the conversation. Pick one discussion and stay on point. Don’t confuse your needs with your partner’s. You are two different people and as such will require different kinds of support. Be willing to express your needs and listen wholeheartedly to your partner’s. Be aware of how activated you are and take the necessary steps to maintain a regulated nervous system. Above all, please do not assume that your attachment style is wrong. There is no right or wrong. There is simply awareness of what it takes for your attachment system to regulate. Asking for the support you need and receiving it allows you to move from insecure attachment to a more secure style of attachment. If your needs are continually denied or ignored this tells you a lot about the future of your relationship. 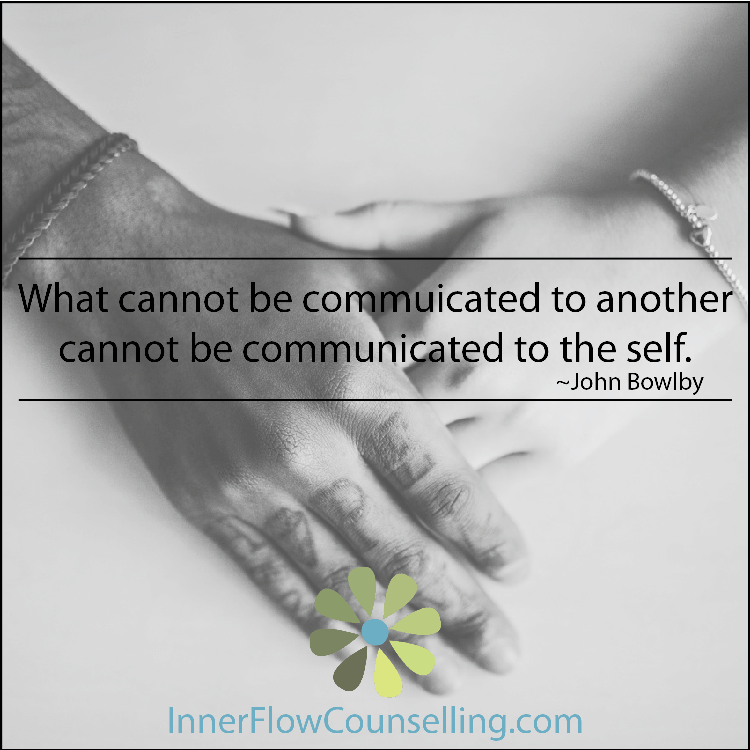 In part one we looked at a foundational aspect of communication – embodied listening. In part two we explored how vital clarity is to keeping yourself and your conversations on track. In part three we will be diving into some physiological reasons why staying present and why the ability to express oneself can be a challenge when stress levels increase. An effective and simplistic way to understand the brain is Daniel Siegel’s widely known hand model of the brain. The reptilian brain – The wrist (spinal cord) and palm (brain stem) regulate basic bodily functions such as breathing, heart rate, and survival instinct. This survival instinct is responsible for the fight-flight-freeze response. The mammalian brain – The thumb (limbic area) together with the wrist and palm process emotion, sensation, motivation, memory encoding, and attachment in relationships. 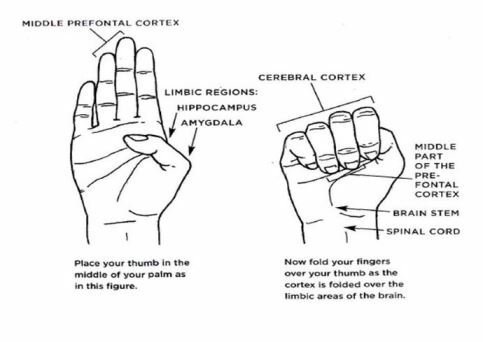 The cerebral cortex – The fingers (cerebral cortex) are responsible for such things as consciousness and cognition. The ring and middle finger (medial pre-frontal cortex) aid us in awareness and attention. All together our fingers are responsible for executive functioning. As well, they help regulate our nervous system, calm fear, and attune to others through empathy and compassion. Painful experiences, referring to the hand model, are stored in the thumb. These memories become generalized so that we are not required to repeat the same lessons over and over again; this a conditioned response based in survival and self-protection. If something in our internal or external environment is suggestive of a painful memory the fingers go offline; this only takes a quarter of a second to occur. As Daniel Siegel says we “flip our lid”. This means our ability to attune to another person is diminished and reasoning is stalled. Adrenaline levels surge and the sympathetic nervous system amps up, creating a fight-flight-freeze state. If you recall some previous experiences I am sure you have some familiarity with this response; a sudden sense of overwhelm and the inability to stay focused on what your partner is saying. When in a state of sympathetic arousal, finding ways to soothe oneself is necessary before trying to continue a conversation. Soothing can begin by connecting with your partner(s), saying their name(s), or a gentle touch (if that feels right), followed by identifying the precise emotion/sensations that you are experiencing. When we identify emotion accurately, calming neurotransmitters (chemical messengers) are released in the brain. The priority for everyone in the conversation is to reduce pain and remain present. It is important to understand that there is a difference between how support, abandonment, and accountability show up in conversation. Support is the ability to witness your own distinct experience while remaining receptive to your partners unique experience. Abandonment is when you deny your own needs or sense of self to try and resolve the problem. It is normal for there to be discomfort when practicing new ways of communicating. Accountability is acknowledging when you have acted in an unwise manner that has contributed to your partners distress. This is not about caretaking, blaming, or fixing the discomfort, rather it is an opportunity to bring the anxiety into light. Simply speaking about it can lessen the power it holds in that moment. Asking for what you need to keep the conversation moving forward will help you as a couple come closer together. I recommend that each person prepare a list of effective soothing practices that support self-regulation. This list might include such things as: breathing techniques, looking around the room at your favourite item and describing it, pressing into a wall, moving your body in a conscious and intentional manner. I can’t stress enough the importance of finding functional and supportive ways to self-soothe. Developing this tool box will help you in many aspects of your life. Being regulated allows us to continue conversations without confusing our past with our present. It takes practice to become aware of when we are disconnecting and becoming reactive. The practice is to reflect inward with compassion and be honest about what we are experiencing and what we require. We can also support our partners’ process by gently reflecting back to them what we are seeing. Navigating this process together we develop the skills that help us trust ourselves and our partners with our pain. When it comes down to it, we all really want to know that our partners will be there for us, meaning that they will hear us, see us, and receive us as best as they can.